by Chris Woodford. Last updated: September 17, 2018. Synthesizers are the most modest musical instruments you can imagine. They look like small and rather mundane electronic pianos, but they're actually much more than that. If you can play a synthesizer, you can play not just any instrument in the orchestra but any instrument you could possibly imagine. Synthesizers have radically changed popular music since they were first widely used in the early 1970s; hardly a pop record is made these days without featuring an electronic keyboard of some kind. How do these amazing gadgets work? Let's take a closer look! Photo: Two in one: There are two completely separate electronic synthesizer keyboards stacked together here. The top one is a 61-key Yamaha Motif ES 6; underneath there's a Kurzweil. Unlike a piano, the sounds from these keyboards can be changed in all kinds of ways using the switches and knobs at the top. A small digital display (green, center) helps you program the machine. Photo by Edward G. Martens courtesy of US Navy. Photo: The Yamaha DX-9 synthesizer, popular in the 1980s, is much more than just an electronic piano. Other famous makes of synthesizers include Moog, Roland, Korg, and Casio. A synthesizer (sometimes spelled "synthesiser") is an electronic keyboard that can generate or copy virtually any kind of sound, making it able to mimic the sound of a traditional instrument, such as a violin or piano, or create brand new, undreamed of sounds—like the crunch of footsteps on the surface of Mars or the noise blood cells make when they tumble through our veins. "Synthesize" means to make something new, often by putting it together from existing pieces. So we can think of a synthesizer as an electronic gadget that makes new sounds by piecing together "old" ones. To understand how it does that, we need to know more about sound and how different instruments produce it in different ways. Suppose you're sitting in a room with a friend who has a large drum that she bangs from time to time with a large stick so, every so often, you hear a drum beat. What sort of science is going on here? Playing and hearing the drum actually involves a series of steps in which energy is converted from one from to another. Photo: A marching drummer is firing sound energy off in all directions. 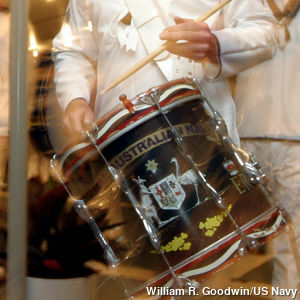 Photo of drummers from from the Royal Australian Navy by William R. Goodwin courtesy of US Navy. When your friend lifts her drum-stick, she gives her arm (and the stick) potential energy (the ability to do something). When she lowers her arm, moving it back toward the drum skin at some speed, it has kinetic energy (the energy something has because it's moving). As the drum stick contacts the taut drum skin, the skin soaks up most of the energy and starts to vibrate. In other words, it has the kinetic energy now. As the skin vibrates, it pushes the air molecules that are in contact with it. The air molecules vibrate too, with each molecule causing neighboring molecules to start vibrating as well. Before long, all the air molecules in the room are vibrating. Some of them vibrate right next to your ear; others vibrate in your ear canal. Inside your ear, the vibrating air molecules make tiny hairs vibrate. The hairs stimulate nerve cells, which send signals to your brain—and your brain perceives these signals as sounds. In short, we can think of sounds as waves of energy traveling from something that is moving back and forth (vibrating or oscillating) to our ears. The waves travel by alternately squeezing and stretching the air; if there's no air in the room, they cannot travel at all. That's why you can't hear sounds in space, where there's no air, or traveling in a vacuum. If you could see sound waves moving, you'd see the air squeezing and stretching all over your room like an old-fashioned concertina. In science, the squeezed parts of the air are known as compressions (because the air molecules are pressed together) and the stretched parts are called rarefactions (because the air molecules are thinned out and less dense). Two key features of a sound wave control what it sounds like to us. The frequency (how many times the wave vibrates in one second) is broadly related to the pitch of the sound we hear. So we hear a high-frequency sound as having a higher pitch. In other words, a choir boy's voice produces a mixture of sound waves of generally higher frequency than an adult man's voice. The amplitude (volume) of a sound is related to the amount of energy that the sound waves carry. When you bang a drum hard, you make more energetic sound waves with more amplitude that you hear as louder sounds. Read more in our main article about sound. What makes one instrument sound different from another? When two instruments play exactly the same musical note, at roughly the same volume, they can sound completely different. How can that be if they're producing the same sound waves? The answer should be obvious: they're not producing the same sound waves! We can use an oscilloscope (an electronic graph-drawing machine, a bit like a cathode-ray TV, only it shows pictures of what waves look like) to see the difference. 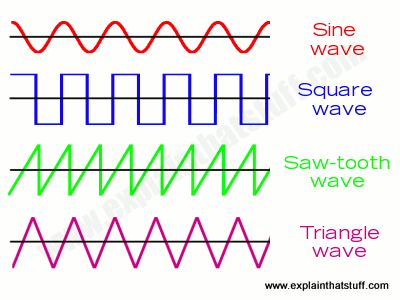 Artwork: Sine, square, sawtooth, and triangular waves as they'd appear on the screen of an oscilloscope. If we play a pure musical note with a tuning fork, the oscilloscope shows an undulating hilly pattern called a sine wave. But if we play the same note with a trumpet, the wave will look more zig-zagged, like the teeth of a saw (it's usually called a saw-tooth wave). If we play the same note again on a flute, we will see triangular waves, while a clarinet, blown hard, playing exactly the same note, might well give us square waves. The shape of the sound waves , which is controlled by how the instrument pumps energy into the world around it—in other words, how it vibrates and makes the air around or inside it vibrate in sympathy—is one of the things that makes instruments sound different from one another. There are other factors too. An instrument doesn't just produce a single sound wave at a single pitch (frequency). Even if it's playing a steady note, it's making many different sound waves at once: it makes one note (called a fundamental frequency or first harmonic) and lots of higher, related notes called harmonics or overtones. The frequency of each harmonic is a multiple of the fundamental frequency. So, if the fundamental frequency is 200Hz (which we can think of as simply 1 × 200Hz), the first harmonic is 400Hz (2 × 200Hz), the second is 600Hz (3 × 200Hz), the third is 800Hz (4 × 200Hz), and so on. Playing together, the harmonics make a dense, complex sound a bit like a barber's shop choir, with low voices and high voices all singing in tune. The more harmonics there are, the richer the sound. A third factor that makes instruments different is the way the sound waves they make change in volume (amplitude) over time. Instruments don't make sounds the way lamps make light: it's not "all" or "nothing." If you press a piano key and release it, the sound changes volume gradually over time. First, it rises quickly (or "attacks") to its maximum volume. Next, the sound "decays" to a lower level and stays there or "sustains." Finally, when we let go of the key, the sound "releases" and dies down to silence. In a piano, the attack phase is fairly slow and the sustain phase can be really long as the notes take a long time to die away. But with a flute, the attack phase is quicker and sharper, there is little decay, the sustain continues for as long as the flautist keeps blowing, and the release is also very fast. The changing pattern of sound volume plays a huge part in what makes one instrument sound different from another. We call the pattern of attack, decay, sustain, and release the ADSR envelope shape. Picture: An ADSR envelope shows how the volume of a musical note changes with time. When a sound plays, it attacks to a maximum volume, decays to a lower level, sustains or holds at that level for a while, then releases back to silence. 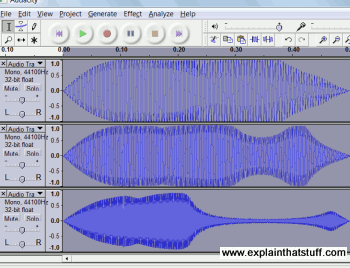 Generate sound waves of different shapes. Generate more than one sound tone at once to produce a fundamental frequency and harmonics. 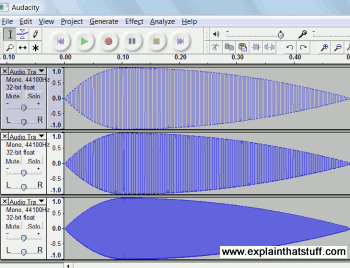 Make the volume of the sound change over time to produce different ADSR envelope shapes. That's pretty much what an electronic synthesizer does in a nutshell. It has a number of different voices or oscillators (sound tone generators), each of which can produce waves of different shapes (sine wave, square wave, saw tooth, triangular wave, and so on). It can combine the waves to make complex sounds, and it can vary the way the sounds attack, decay, sustain, and release to make the sounds mimic existing instruments like pianos. To make a synthesizer sound somewhere between a piano and an organ, you could select a square wave generator (which gives an organ-like sound) and set the ADSR values to be like those of a traditional piano (slowish attack, quickish decay, long sustain and release). Modern synthesizers have "presets" (ready-programmed settings) or "modes" that let you select particular instruments at the flick of a single switch. Of course, you don't have to copy traditional instruments with a synthesizer: you can change the settings to whatever you like—and create all kinds of sounds no-one has ever heard before. In art, there are two ways to make a piece of sculpture. You can take materials you've found in the world around you and stick them together to make something completely new. That would be an example of working in an additive way. Or you can start with something like a big block of stone or wood and chisel it down, slowly reducing it to what you want by stripping bits away. That's working in the opposite—subtractive—way. An oscillator generates the original sound (and you can control it in various ways), which will be a mixture of a fundamental frequency and its harmonics. Most synthesizers have at least a couple of oscillators. A filter cuts out some of the harmonics (for example, by boosting or cutting all harmonics above a certain frequency). An amplifier changes the volume of the sound over time, according to ADSR values that you set (as we discussed above). A second, independent oscillator, known as an LFO (low-frequency oscillator), can be used to vary how the previous three stages work, producing some very interesting effects. For example, if you apply the LFO to the original oscillator, it makes the sound it generates wobble about in what's called a tremelo effect. Yes, this is all sounds a bit abstract and mathematical. It's easiest to understand what it means in practice by experimenting for yourself; at the bottom of this article you'll find some suggestions for apps you can download that let you play around with your own simple subtractive synthesizer. The original synthesizers achieved all this using laboratory-style electronic equipment that generated and manipulated actual sound waves. Instruments like this are known as analog synthesizers because they work directly with the sound waves themselves. Many of these synthesizers had lots of separate, sound-creating modules that could be connected together ("patched") in different ways; that's why they were called modular synthesizers. Photo: Modular Synthesizer is an iPhone app that replicates an analog, modular synthesizer on your smartphone—even down to the neat, old-fashioned "patch cords" (cables) that connect different modules together. Search on "synthesizer" in your favorite app store and you'll find all kinds of neat synthesizers you can play with, from simple on-screen keyboards right up to authentic gadgets like this one, which can export your tunes direct to sites like Soundcloud. The RCA Synthesizer: Back in the 1950s, the world's first analog electronic synthesizer was programmed using reels of paper tape, punched with holes that represented things like the frequency, octave, envelope, and volume of the sounds required. From US Patent 2,855,816: Music synthesizer by Harry F. Olson and Herbert Belar, courtesy of US Patent and Trademark Office. Modern synthesizers do everything digitally, by manipulating numbers with computer chips. Not surprisingly, they're called digital synthesizers. They're essentially computers that have been specially programmed to generate and manipulate sounds. Most synthesizers can be connected up to personal computers, so the computer can be used to store and record the sounds the synthesizer makes or play it automatically. To make this sort of thing easier, computers and synthesizers use a standard way of connecting together known as MIDI (Musical Instrument Digital Interface). Another kind of digital synthesizer, the sampler, lets you feed in a recorded sound (maybe the noise of a sparrow singing) and then manipulate it in various ways by changing the sound settings. So you can make the sparrow sing more quickly by speeding up the sound, or play the bird-song on your keyboard, so the low notes sound like older, heavier birds and the high notes like younger, smaller, and chirpier ones! Synthesizers sound amazingly abstract when you read about them in articles like this—and there's really no substitute for playing with them yourself. 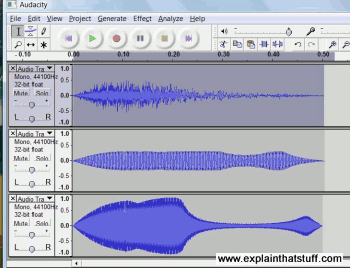 Now you might not be able to afford a multi-thousand dollar synthesizer, but you can download a free sound-editing program called Audacity (for Windows, Linux, and Mac) and experiment with quite a lot of sound-making effects without spending a dime. The great thing about Audacity is that you can see the shapes of the waves you create and listen to them at the same time. I'd really recommend playing around with basic sounds like this for an hour or two before you move on to using realistic synthesizer apps. This way, you'll get a feel for how the shape of a sound corresponds to what you actually hear, which can be difficult to figure out if you just play with an app. I'm not going to explain in detail how to use Audacity, because you can use it for many different things (from converting cassette tapes to MP3s to creating brand new imaginary sounds). To learn about synthesizers, what you need to do is experiment with the tabs marked "Generate" (which can produce sound wave tones of different shapes and frequencies, as well as "white noise"—sound spread equally across a wide range of frequencies) and "Effect" (which will shape the envelopes of the tones you've generated or change them in other interesting ways). Here are three quick examples of sounds I've made to give you an idea. Clearly we could go on doing this forever. We could add any number of sounds, change their frequencies, durations, wave shapes, or envelopes, and refine each component sound in many different ways. With a synthesizer, the possibilities really are infinite! 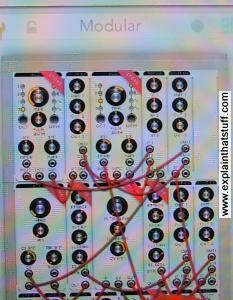 Artwork: A screenshot of Common Analog Synthesizer by oxxxide. Although it has only a puny keyboard (which you can scroll up and down for higher and lower notes), it's a surprisingly powerful demonstration of basic subtractive synthesis and a good place to go next. While you can certainly create some interesting sounds with Audacity, they have to be individually built around specific frequencies. There's no way to create a sound with a certain character and then transpose it up and down a scale, as you'd do with a normal musical instrument; in other words, you can't play tunes. So once you've mastered Audacity (or exhausted it, depending on your point of view), it's time to move on to a real synthesizer. Assuming you haven't got access to an actual synth, nip along to your favorite app store and search for "synthesizer." On the iPhone/iTunes store, you'll find quite a few very realistic synth apps like Modular (from Pulse Code), KORG Gadget (from KORG themselves), and Peter Vogel CMI (a faithful, mini-reproduction of the classic Fairlight CMI synthesizer from the 1980s produced by its original inventor). Over in Android land, Common Analog Synthesizer (from oxxxide) is a great place to start; very similar to the basic subtractive synthesizer I outlined above, it has two oscillators (offering a choice of sine, square, pulse, and sawtooth wave), an ADSR filter, an ADSR amplifier, an LFO, and a few other bits and pieces. If you haven't got a smartphone or tablet, don't despair; there are also various PC synthesizer programs (such as the CM101 produced a few years ago by Muon Software and now superseded by various improved models). 1863: German physicist Hermann Helmholtz (1821–1894) develops the modern scientific theory of how we hear music by perceiving sound tones. 1917: Léon Thérémin (1896–1993) invents the Thérémin, a radio-like box that makes an eerie swooping noise when you move your hand nearer to or further from its antenna. It's still widely used in horror movies to this day. 1922: Maurice Martenot (1898–1980) develops the Ondes Martenot, one of the first electronic keyboard instruments. It features in numerous 20th-century orchestral compositions, notably Oliver Messiaen's Turangalîla Symphony (composed in 1949). 1954: Harry F. Olsen (1901–1982) produces the groundbreaking RCA synthesizer. 1950s–2000s: Influential German composer Karlheinz Stockhausen (1928–2007) bridges the gap between the worlds of classical and electronic music. 1964: After experimenting with Thérémins, Robert Moog (1934–2005) develops his pioneering, affordable Moog synthesizers, ushering in the age of electronic music. 1970s: Electronic music becomes hugely popular thanks to German bands Tangerine Dream and Kraftwerk and French musician Jean-Michel Jarre. Late 1970s: Digital sampler-synthesizers such as the Fairlight CMI and Synclavier lead to a huge increase in sampled and digitally treated electronic music in the early 1980s. 1982: Computer scientist (and later futurologist) Ray Kurzweil (1948–) begins developing digital electronic keyboards. 1984: Different synthesizer makers agree to use the MIDI interface to provide a standard way of connecting together computers and electronic musical instruments. 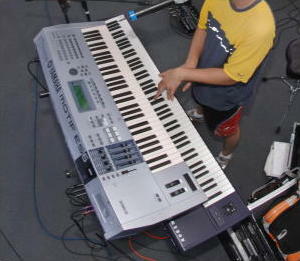 Yamaha's DX7 was one of the first commercially available machines to use MIDI. 1990s: Musicians and computer scientists such as Jaron Lanier (1960–) develop virtual reality instruments. 2011: Synthesizer pioneer Peter Vogel (1954–) launches an iPhone app version of his classic Fairlight CMI synthesizer from the 1980s. Synth Museum: A museum of classic synthesizers. Vintage Synth Explorer: Another museum of analog and digital synthesizers. Music From Outer Space: If you're a synth beginner, but you have at least a basic grasp of electronics, the late Ray Wilson's website is a great to start your experiments with DIY synthesizers. Also check out the MFOS YouTube channel (and Ray's MAKE book, listed below). Electronic and Experimental Music by Thom Holmes. Routledge, 2015. MAKE: Analog Synthesizers by Ray Wilson, Maker Media, 2013. Cambridge Introductions: Electronic Music by Nicholas Collins, Margaret Schedel, and Scott Wilson. Cambridge University Press, 2013. Analog Synthesizers by Mark Jenkins. Elsevier, 2007/2018. Analog Days: The Invention and Impact of the Moog Synthesizer by Trevor Pinch, Frank Trocco. Harvard University Press, 2004. Vintage Synthesizers: Groundbreaking Instruments and Pioneering Designers of Electronic Music Synthesizers by Mark Vail. Backbeat, 2000. Experimental Music: Cage and Beyond by Michael Nyman. Cambridge University Press, 1999. 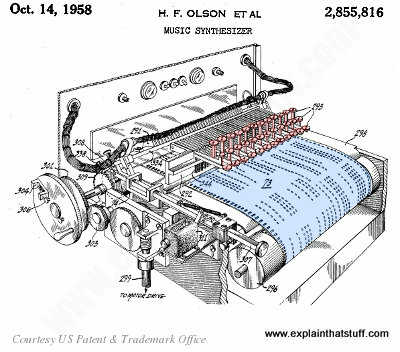 US Patent 2,855,816: Music synthesizer by Harry F. Olson and Herbert Belar, RCA, October 14, 1958. A detailed description of the RCA synthesizer, including circuit diagrams. US Patent 3,316,341: Electrical musical instruments by Richard Peterson, Columbia Records, April 25, 1967. 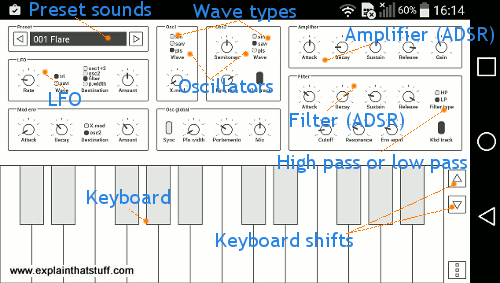 Describes a synthesizer that works by harmonic synthesis, wave distortion, and filtering. US Patent 4,301,704: Electronic musical instrument by Yohei Nagai et al, November 24, 1981. An early digital synthesizer. US Patent 4,554,855: Partial timbre sound synthesis method and instrument by Sydney A. Alonso and Cameron W. Jones, New England Digital, November 26, 1985. Describes a state-of-the-art polyphonic Synclavier synthesizer from the mid-180s. Legendary instruments: French electronic music pioneer Jean-Michel Jarre demonstrates some of the analog synthesizers he used back in the 1970s. Inside a Mellotron M400: How the Mellotron Works: Not all electronic keyboard instruments work by synthesizing sounds electronically. The Mellotron, for example, had an ingenious mechanism for playing little loops of magnetic tape when you pressed down on its keys. In this wonderful video, Alison from Bell Tone Synth Works explains how it works. Also worth watching is The Mellotron: A Keyboard with the Power of an Orchestra from British Pathé, 1965. Peter Vogel demonstrates the Fairlight CMI 30A: A fascinating 10-minute interview and demonstration featuring the Fairlight's inventor. The Fairlight was a groundbreaking sampler-synthesizer that featured on many 1980s hit records. Synclavier: Harmonic Additive Synthesis: This clip will mean much more to you if you've already read my explanation of additive synthesis up above. Again, we start off with a basic tone, add in some harmonics, and then shape the envelope. It's the sound of the future—the Moog synthesizer: A great little 5-minute video from BBC Tomorrow's World, recorded in 1969, which explains what a Moog synthesizer does and how it works.